You will earn 3,696 Reward Points. Earn 1 reward point for every 1 dollar spent. Hatco Drop-in Frost Tops keep pre-chilled beverages, snacks, hors d’oeuvres and side dishes cool and ready to serve. Also available in a Slim Line Series, providing wider access to your customer, regardless of the sneeze guards. 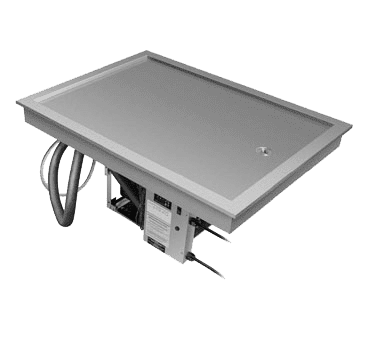 Drop-In Frost Tops - The Drop-In Frost Top shall be a Model ... as manufactured by the Hatco Corporation, Milwaukee, WI 53234 U.S.A. The Frost Top shall be rated at ... watts, ... volts and be ... inches (millimeters) in overall width. It shall utilize R-404A refrigerant and consist of aluminized steel housing, electronic temperature control, condensing unit, compressor, and flexible refrigerant lines. Accessories may include sheet pans. Warranty consists of 24/7 parts and service assistance (U.S. and Canada only).